To everyone striving for success in life, the invariable stumbling block proves to be the turbulent vagaries of the mind. An undisciplined mind makes a man a slave and wrecks his life. Controlling and subduing it is the most vexing of problems to the earnest seeker of happiness. 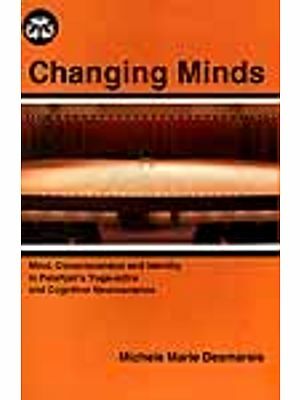 The vital importance of the subject, therefore, prompted H. H. Sri Swami Sivanandaji Maharaj to write this comprehensive work "MIND-ITS MYSTERIES AND CONTROL." 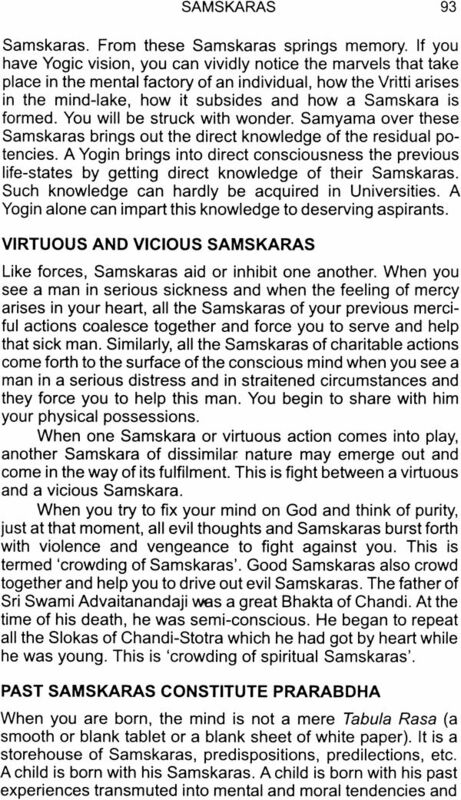 It is meant of serve as a valuable guide to all aspirants and is also of immense help to anyone in any walk of life. 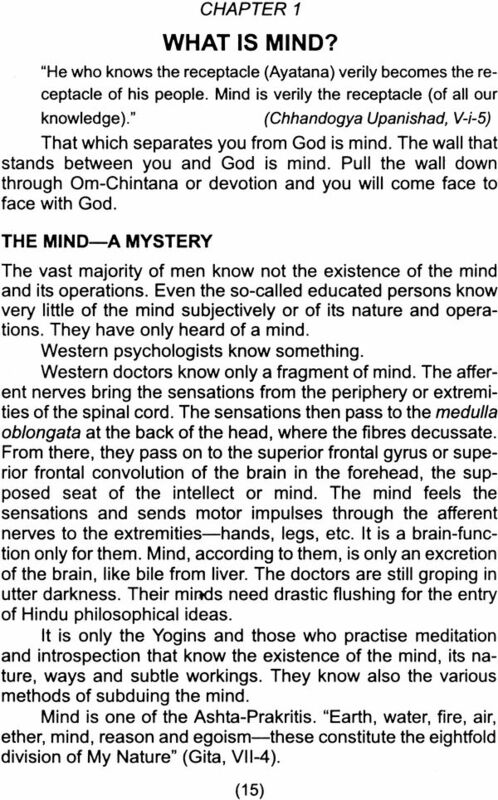 Being the outcome of personal experience of the revered author and written with a practical end in view, "MIND-ITS MYSTERIES AND CONTROL" is a treasure worthy to be possessed and constantly. 'Moksha' is freedom from births and deaths and the attainment of supreme Immortal Bliss. Moksha is the goal of life. 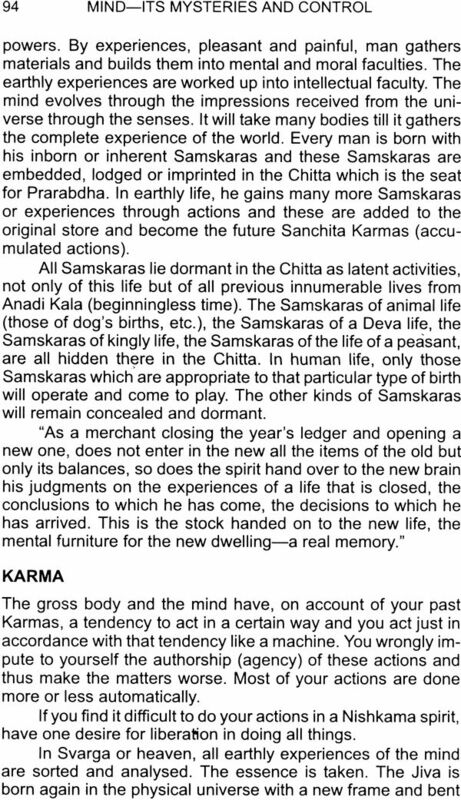 Moksha Gita is the essence of Vedanta and all Upanishads. It is the "Song of Salvation". It will throw much light on the spiritual path and help you all in the attainment of freedom and Immortality. Happiness has for ever been the prime aim of every human being. All activities of man are directed towards acquiring the maximum happiness in life. But, through the wrong deluded notion that objects will give happiness, man searches for it outside. The result is that in spite of all his lifelong efforts, he gets disappointment only. Vexation and misery alone are to be seen everywhere. The real lasting happiness lies within man. Such happiness or Ananda is the Inner Self, the Antaratman. The very nature of Atman is pure Joy. This is never perceived because the mind is completely externalized. As long as the mind is restlessly wandering about amidst objects, ever fluctuating, excited, agitated and uncontrolled, this true joy cannot be realised and enjoyed. To control the restless mind and perfectly still all thoughts and cravings is the greatest problem of man. If he has subjugated the mind, he is the Emperor of emperors. For gaining mastery over the mind, you have to know what it is, how it works, how it deceives you a every turn and by what methodsit can subdued. 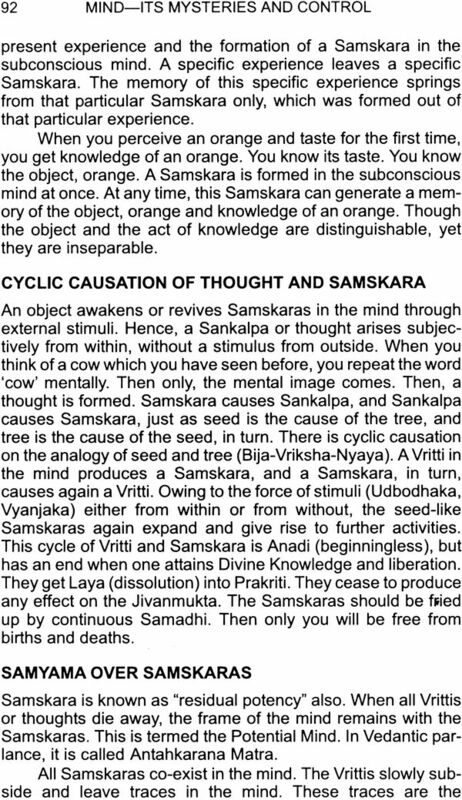 In this book, the subject has been dealt with; and the nature of the mind, the various forms that is assumes, the secret of its inner workings and the way to control it are fully and clearly explained. The previous editions were eagerly read and appreciated by thousands of aspirants who wrote to say how immensely they were helped by the instructions. The lessons and instructions are eminently practical and many helpful ideas and suggestions got during my meditations have been recorded and put down here. 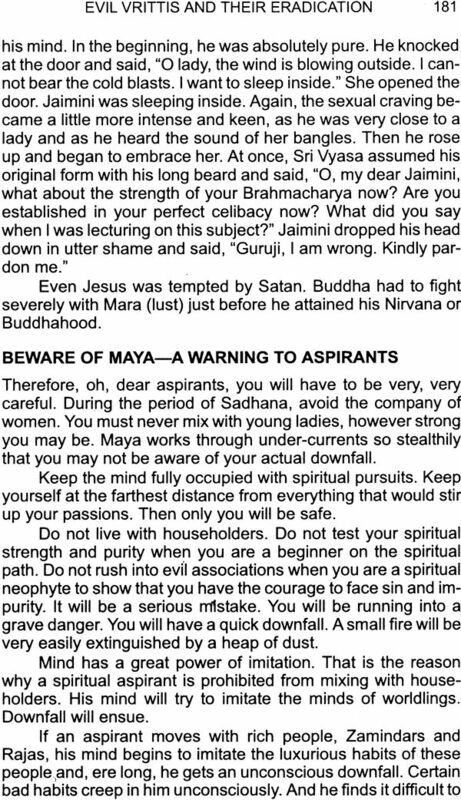 Very useful hints on concentration and meditation will be found in the book which, if faithfully followed, will bring success in a short time without fail. I pray to every aspirant to study constantly the valuable instructions with can and follow the practical hints given in his Sadhana and daily life. It will doubtless enable you to gain control over your passions and craving and to get established in Yoga. 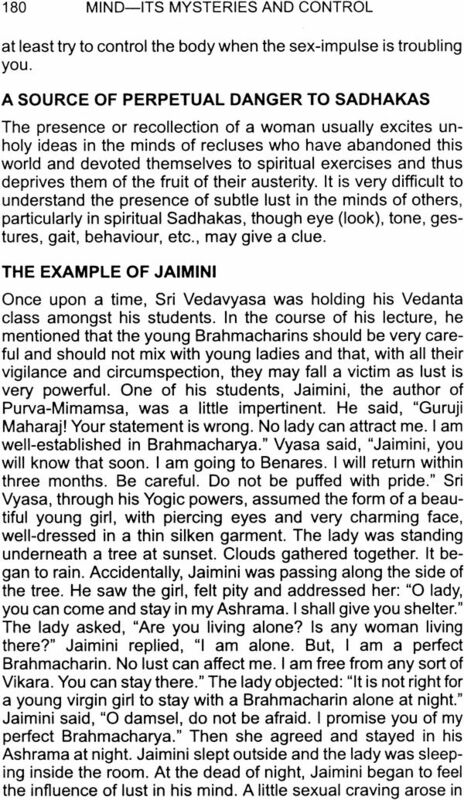 The Bhakta, the student of Vedanta, the Raja Yogin, the Karma Yogin- all will find this book an indispensable guide. 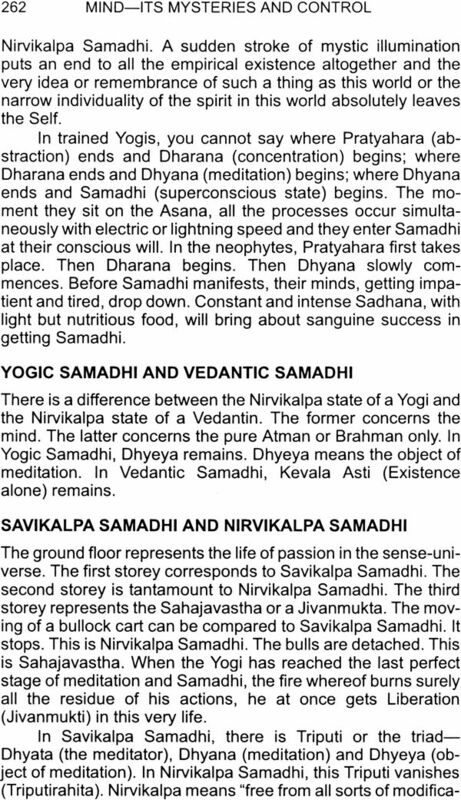 The later stages of Yoga Sadhana are common in all the four paths and Dharana and Dhyana are quite impossible without first subduring the mind. 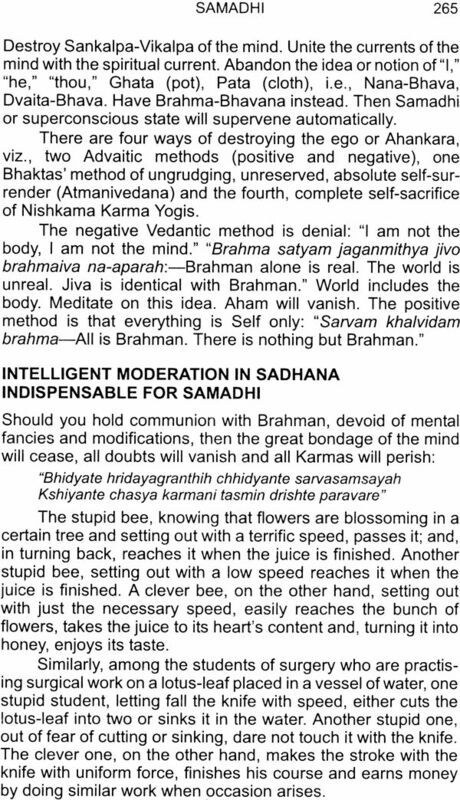 All Sadhanas are, therefore, aimed at obtaining mastery over the mind. Hence it is that I have tried to present the ways and means of achieving this through simple, yet well-tried and effective methods. My efforts would be amply fulfilled if even a single earnest aspirant is helped on the spiritual path and attains the Goal. 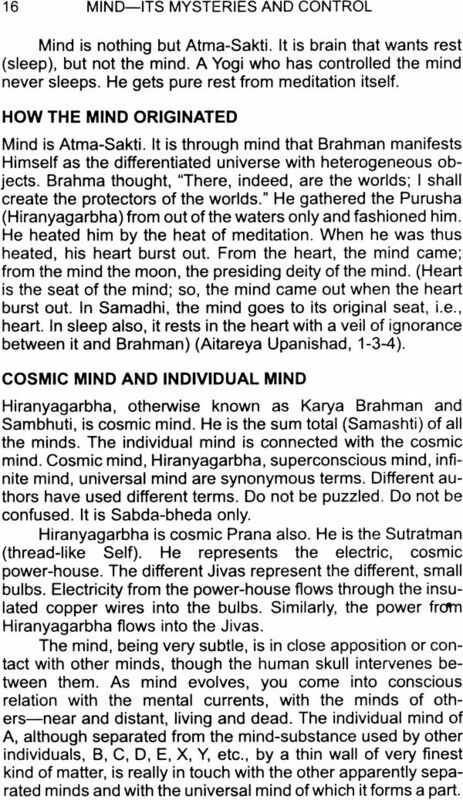 May the Lord, the Antaryamin, the Supreme Indweller inspire all to attempt mind-control and Yoga! May He bestow success on the sincere aspirants that struggle to master the unruly mind! May you reach the Goal of Life, Immortality, Supreme Knowledge and Bliss!.